No matter what you need a primer for or how much money you have to spend, you’ll find a great option for you on this list. Primers help your makeup last longer with fewer touch-ups. Some primers also do specific things to help your skin, either by adding radiance or shrinking pores. Primers are very popular makeup bases for this reason. Sometimes they can even replace moisturizers. Is a primer different than a moisturizer? Generally speaking, yes, though there are certain moisturizers that will work as primers and primers that can replace moisturizers. These are rare, though. Particularly in the case of moisturizers that are supposed to minimize/shrink pores, it’s rare for them to be able to replace a moisturizer. A more hydrating primer, though, might indeed replace a moisturizer. Generally speaking, moisturizers are meant to add moisture, and primers are meant to set the face up for makeup. However, as mentioned, there is some overlap. Obviously, the most important thing was that the primer lasted for 24 hours. All of these passed the test, though some with more flying colors than others. We also put an eye toward price: we have both high-end and drugstore options for you to choose from. No matter what your budget is, there’s an option for you here. Primers can range wildly in price, like most other kinds of makeup. There are some drugstore primers that are under $5, and some primers can reach above $100. In this article, we went with primers that cost between $5 and $75 dollars. It smoothes fine lines and tightens facial features. It also provides an even finish under makeup. If you’re the sort of person who needs to have the best of the best, then you’ll definitely fall in love with Guerlain L’Or Pure Radiance Face Primer. This product literally has 24-carat gold flakes in it, which probably accounts for its high price tag. However, Guerlain L’Or Pure Radiance Face Primer does rank very highly when ensuring that your makeup lasts 24 hours or beyond, if necessary. Probably the most striking feature of Guerlain L’Or Pure Radiance Face Primer is the 24-carat gold that comes along with the formula. 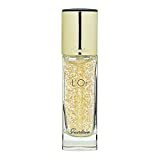 The consistency of Guerlain L’Or Pure Radiance Face Primer is a bit runny, but it does work smoothly into the skin and will produce a slight radiance after the gold has dissolved into the skin. The Guerlain L’Or Pure Radiance Face Primer is a primer that you can actually wear on its own and get decent results with. When we used it, we noticed that our pores were tightened and the appearance of our skin was a little bit brighter (but no shimmer, if you’re worried about that). It has a cooling effect on the skin, as well. The smell is not overwhelming. The major con is the price. Not many people want to spend more than $50 on a primer. However, if you’re in the market to do it, the Guerlain L’Or Pure Radiance Face Primer is a great place to make an investment. This is a great choice for those who like to wear heavy, full foundation. The famous Kat Von D tends to wear a lot of makeup herself, so if you like to wear a full face, her Kat Von D Lock-It Hydrating Face Primer is a great choice. The main component to the Kat Von D Lock-It Hydrating Face Primer is the hydrating part; it works to fill in your pores and keep your skin hydrated so that heavier foundations won’t settle their way into fine lines on your skin. It does an excellent job of this. It also has a lightweight texture, so your skin won’t feel overloaded with product. The biggest pro to the Kat Von D Lock-It Hydrating Face Primer is that it really does work to keep your foundation in place for 24 hours. It’s one of the longest-lasting face primers that we have tried. The fact that it will perform heavy-duty with strong foundations is also a plus. Nobody wants the “melting face” look. The major con is that this is a bit overkill if you don't want to wear a full face. In fact, it’s recommended that if you aren’t wearing a heavy foundation that you instead mix the primer with the lighter foundation. Again, if you aren’t that into heavy makeup, this probably isn’t the product for you. This is a great primer to reach for if your pores are seriously a bane. We haven’t encountered a better primer for this purpose. The POREfessional Face Primer by Benefit is definitely the answer to your prayers if you ever thought that your pores look like craters. This will definitely smooth them out. The POREfessional Face Primer by Benefit is a thicker formula, unlike the first two that are more like serums. The thicker formula will allow it to work its way deeper into your pores, which is what gives the POREfessional Face Primer by Benefit its utility. The thicker primer will make sure that your pores stay minimized. Again, if you have issues with your pores, this is the best pick for you. It will fill in your pores and keep your makeup going for the full 24 hours. It’s one of the more affordable primers on the market when you consider the amount of efficacy it has. The main negative is that this isn’t really a primer we’d recommend using all over your face. You really want to concentrate it on areas that have big pores or perhaps areas of your face that get the oiliest (like your T-zone); otherwise, you might find it a bit drying. We wanted to include some drugstore options in this list as well, and the Rimmel London #Instaflawless Primer is a great choice if you’re looking for something under $10 that will get the job done and not break the bank. It does a fantastic job on dull skin and lasts for a very long time. 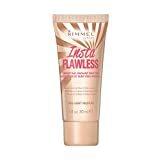 The Rimmel London #Instaflawless Primer actually looks and feels more like a tinted moisturizer than a primer, and it does come in a couple of different colors. You can wear it on its own, and it will definitely brighten up skin slightly. It won’t dry out your skin, and definitely gives it a bit of a glow. One of the pros of the Rimmel London #Instaflawless Primer is definitely the price. It’s difficult to find a better primer than this for under $10. We were very impressed with the Rimmel London #Instaflawless Primer’s performance. We will say that the higher-end primers were much more potent, but for the price difference, it’s worth considering. The major con to the Rimmel London #Instaflawless Primer is the lack of shades it offers. This can make it a bit difficult for ladies of different skin tones to get the Rimmel London #Instaflawless Primer to work for them. We hope they come up with a bigger diversity of colors in the future. Here’s another drugstore contender that is very impressive for the price point it commands. The L’Oreal Paris Lumi Magique Primer is a bit more expensive than the Rimmel London #Instaflawless Primer, but since it’s well under $15, we can’t complain too much. The L’Oreal Paris Lumi Magique Primer will feel more like a moisturizer than a primer, and it gives many of the same benefits that a moisturizer would. It will hydrate your skin and give you a pearlescent glow of sorts. This is a great primer to use on its own if you are in a hurry in the morning, particularly if you have dry skin. 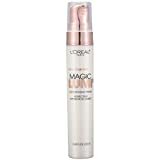 One of the biggest pros of the L’Oreal Paris Lumi Magique Primer is the price. This is a very affordable primer that will last for 24 hours. It can be difficult to get this kind of power at this price point. Particularly for those who have dry skin, the L’Oreal Paris Lumi Magique Primer may be life-changing. The major con is that this one isn’t going to last as long as some of the higher-end primers. The L’Oreal Paris Lumi Magique Primer should take you to hour 24, but you’re going to have to do a little more blotting than you would with the Kat Von D, for instance. While makeup is a very personal thing and your choices will be influenced not only by your own preferences but by your budget, we have to go with the Kat Von D Lock-It Hydrating Face Primer for the best overall. It may be overkill for people who aren’t wearing full-face makeup, but, to be honest, it’s people who are doing that who need primers more than anybody else. If you are after that flawless look, the Kat Von D Lock-It Hydrating Face Primer will help you attain it and keep the primer locked in place for hours. Plus, we find that the price is relatively reasonable for the amount of product you get and the performance that you receive from it. If you are dead-set on a drugstore brand, then we recommend the L’Oreal Paris Lumi Magique Primer. This is a great brand for the price, and it does a fantastic job of brightening up dull skin. This may not be the best formula if you have extremely oily skin, but if you have combination, normal or dry skin, you’re sure to be impressed with how well the L’Oreal Paris Lumi Magique Primer performs for the price.